And now I proudly present to you, Droebel the crochet dog, woof! 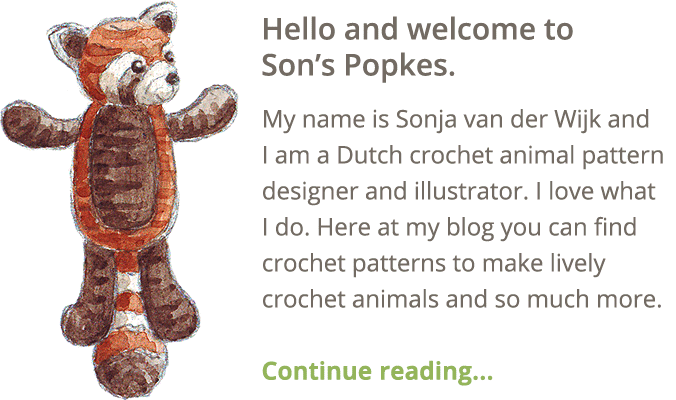 When I designed this crochet pattern, creating a dog looking doll was my idea. A funny looking amigurumi character that could be enjoyed by every one who loves dogs and animals. I think I succeeded and am ever so excited, isn’t he cute! It was when Droebel was finished that I noticed he reminds me a little bit of Gromit, that clever and pleasant companion of Wallace. You know, from those amazing clay animations created by Aardman. I can easily imagine Droebel having all sorts of thrilling adventures. Yes, he is an adventure dog. Just look at him! Generally, I find the sketch and the doll of a similar cuteness. The dolls never are exactly as the sketches, but they come close. This time however, I find the doll much cuter and better looking than the sketch I made. Droebel looks like the younger version of himself in the sketch. I’m very happy I managed to get that puppy look. Maybe it is because of my new shaping technique for which I used a rather simple and clever trick. 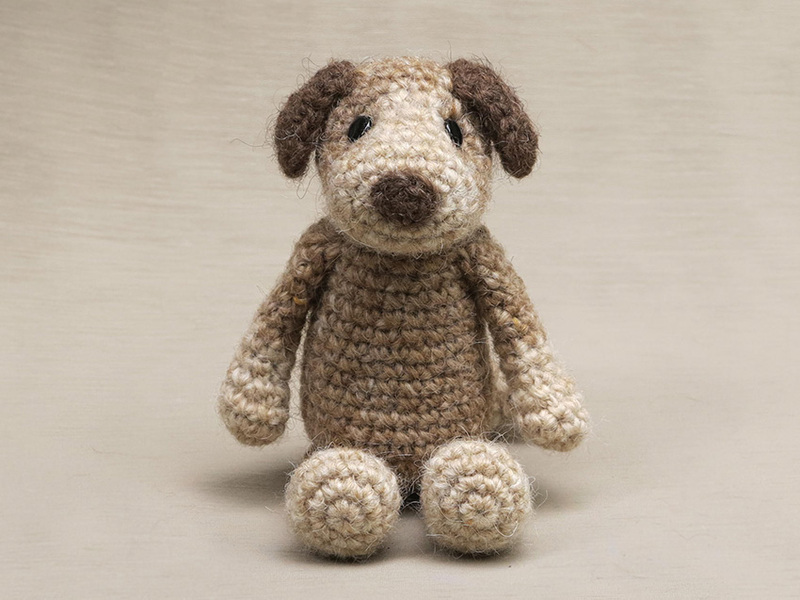 For this crochet dog pattern I have chosen to use soft colours. It makes him look very rustic and even a bit retro, which I like. Droebel is sitting 4.9 inch/ 12.5 cm when made with a worsted weight yarn. I thought of giving him a coloured collar or handkerchief scarf, but decided not to and leave him plain and simple. It is up to you crafters to give him accessories and I’m sure some of you will not hesitate to do so! 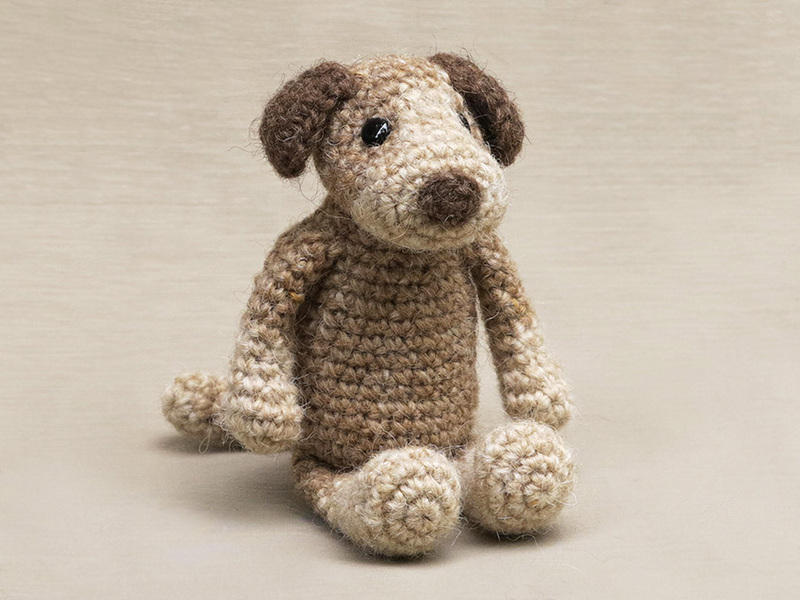 The crochet pattern for Droebel the dog you can find in my main shop and in my shop at Ravelry. 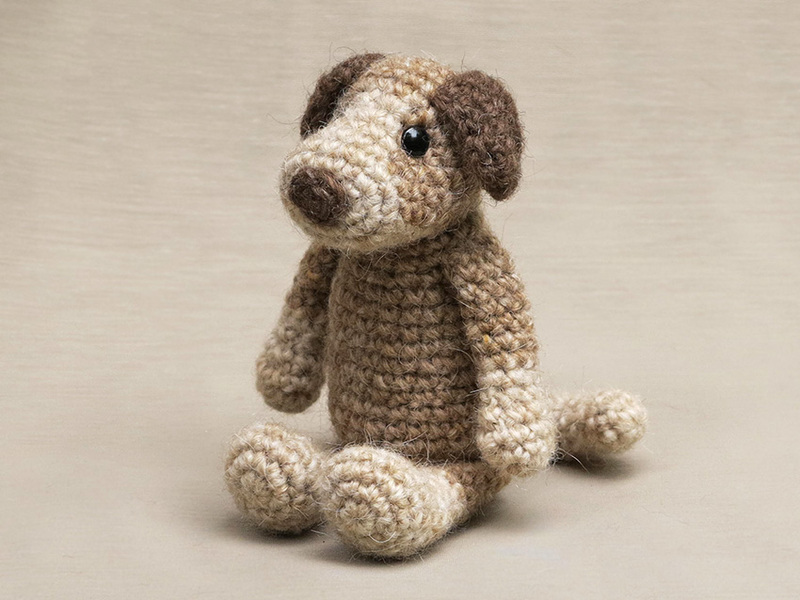 As always, it contains a clear description of how to crochet and assemble the wee dog with example pictures at the bottom to help you get everything right. 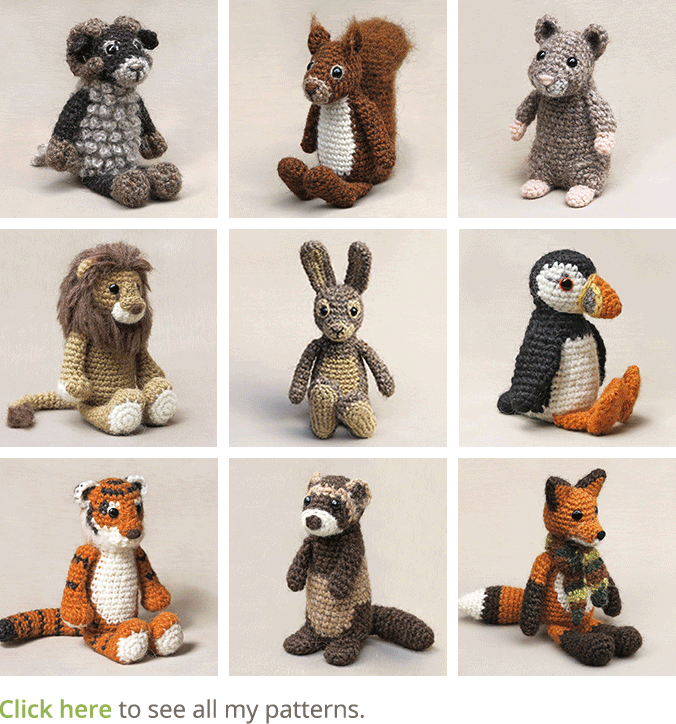 In the pattern you can also find what materials you need, the yarn colour numbers, in short, everything you need to know to make your own barking friend. 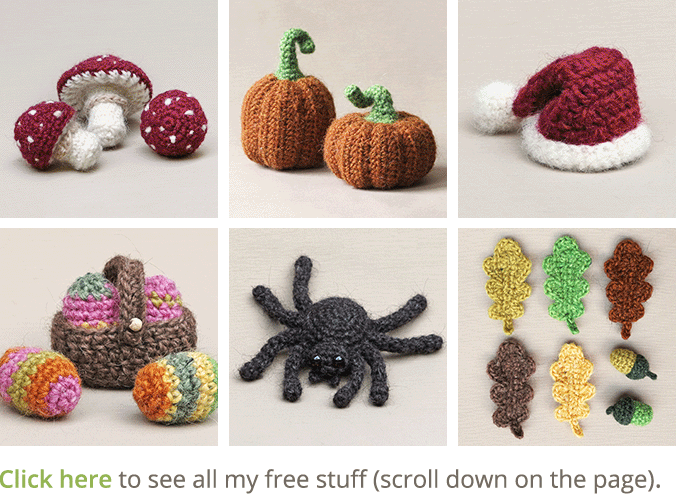 And heads up, the pattern has a one dollar release discount till the end of May. Oh gosh sooooo sweet and yes you can imagine the mischief he will get up to.What fun I cannot wait to make him mine. Thanks Christine, looking forward to see yours when he’s finished. That’s quite cute, I really like it! And I agree with you, it’s better than the drawing. It has something amusing I did not find in the sketch version. By the way, does ‘Droebel’ mean anything? Hi Gabriele, you’re right. The drawing is more serious. And no, Droebel (pronounced drooble) is just a name. Well, I guess there are Dutch people who have Droebel as last name, actually, Cornelius Fudge from Harry Potter in Dutch is called Cornelis Droebel. But it isn’t a very common name. Cornelis Droebel? That’s a really curious adaptation! Do you know if there is any meaning behind this translation choice? The funny thing is, in Italian his name is Cornelius Caramell, from ‘caramello’, which means… fudge (the sweet, not the verb)! He’s SO cute! I am forcing myself to finish the patterns I have before I buy more, but then . . . I guess he is a little like Gromit (whom we LOVE at this house – my son got a Gromit plushy many years ago who still hangs out with us (yes, we’re a little strange over here)), who is also a bit like Snoopy in a way. That’s very interesting that Cornelius Fudge is Cornelius Droebel, but Droebel doesn’t mean anything. How do you say fudge in Dutch? We must be just as ‘strange’ as you guys Rhonda. We have lots of plushes. Its just lovely. I have two Snoopy dolls here. We the Dutch often just use English words, as far as I know there isn’t a Dutch word for Fudge and we pronounce it just as fudge (with a silly Dutch accent). I think I WILL get the dog pattern now after all. 😉 Off to purchase it . . . I got it on your Craftsy page.